The Compulsive Reader: Cool New Reads! Molly is a bit of a nerd. She has a full scholarship to Columbia in New York City, and is obsessed with school, physics…and Mark Dahl. Mark is her gorgeous lab partner, and the love of her life. He just doesn't realize it yet. And at the close of their senior year in their tiny Minnesota town, Molly despairs of ever seeing him again. But she is shocked and delighted to find that he is moving to New Jersey, and knows that they are meant to be. But Molly isn't in New York very long before she finds out Mark's secret. He's gay. And no one but Molly knows. Suddenly their relationship shifts wildly, and Molly finds herself trying to be just a friend to the guy she was sure she was meant to be with, while at the same time trying to mend her broken heart. Twelve Long Months chronicles Molly and Mark's relationship beautifully. Told from Molly's point of view, it is a vivid look at what happens when suddenly your dreams and expectations collide with real life, and how you can pick up the pieces in order to move on. Molly's voice rings true, and you'll empathize with her as she struggles to make her way through her first year of college, and balance friends, work, and a love life. Malloy's writing is very effective and personal. His ability to reach out to the reader and make that strong connection between protagonist and audience is remarkable. Twelve Long Months is a well drawn out, gratifying, and very humorous read that will especially appeal to anyone who has ever understood the heartbreak of a crush. Matisse can't help but feel bitter when her mother moves her and her father, who has a debilitating disease, away from their wonderful home in New York City, to Prague, New York, a tiny town in the middle of nowhere. Stuck in a high school whose name she can't even pronounce, without any friends, and nothing to do is miserable for Matisse. People either want to talk about her dad (which Matisse isn't ready to do), or pretend everything is fine (Matisse knows it isn't). But if Matisse wants to make in Prague, she'll have to learn to open up to new things and people, and accept her situation at hand. Alive and Well in Prague, New York was a very heartfelt read. Grab's smooth, empathetic writing will easily reel in readers by the hordes as she artfully portrays the hurt of everyone knowing your business in a small town, and the joy of true friends. Matisse is smart, practical, and yet very hard headed. Your heart will go out to her as she tries to balance school, friends (or lack thereof), and the situation at home. Grab captures the essence of small town life perfectly; quirky, quintessential, and endearing, Prague will appeal mightily to readers who have ever been curious about small town life, or to those who know exactly what it's like, and can easily commiserate and identify with with Matisse. For Serena Nelson, fitting in has never been easy, but it was possible. A punk skater at heart, she had her own niche of likeminded friends who didn't mind that she was deaf. Serena's talents for lip reading are excellent, and allow her to live a pretty normal life. But when she moves to a small town, the preps in her new school see her talent as something to profit off of, and use Serena to get the juiciest gossip, enticing her with a membership into a secret sorority and the promise of fitting in. But will her so called friends go too far? Read My Lips is an attention grabbing page turner. Serena is a smart and edgy narrator, who is quite normal despite her condition, and doesn't seek attention because of it. Her desire to fit in is something that we can all empathize with, and the lengths that she goes to do so are relatable. But it's how she fights back and overcomes those that belittle her that makes Read My Lips such a compelling and quick read. Read My Lips is a delightful mix of complex characters, biting wit, and the angst that comes with making new friends. It would seem that Claire Danvers's life couldn't get any worse, what with living in a college town that is also inhabited by vampires who wouldn't think twice about killing her, and having her parents pressuring her to move back in with them when she already lives with her three best friends. But when Mr. Bishop arrives, things turn positively deadly. No one's really sure what Mr. Bishop wants exactly--all they know is that he's more powerful than anyone--possibly even Amelie, and he lacks any good intentions. Everyone is on their guard. Soon everyone is buzzing about the upcoming formal ball, and all the humans are clamoring for invites, even Claire and Eve. But this is one party that the breathing might want to pass up. 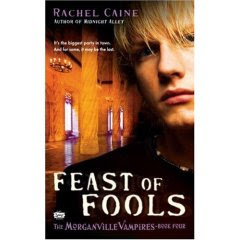 Feast of Fools is an exciting, fast paced and chilling thriller. Caine has a real knack for combining a headstrong heroine, nicely creepy happenings, and a dash of romance and intrigue to bring about a knock out of a novel that'll stun, spellbind, and utterly captivate readers. There's a twist around every corner, and a cliff hanger that will leave readers desperate for more in this wonderful series that's reminiscent of Buffy the Vampire Slayer. A word of caution: once you start into the Morganville Vampires series, it's impossible to let go. When Illinois girl Casey McCloy's mother gets a temporary job in London, she finds herself standing in front of The Bramford, one of New York City's exclusive apartment buildings, ready to move in with her grandmother. It's here that she meets Madison, Phoebe, and Sophie, who are all filthy rich, and take pity on Casey and befriend her. Well, some of them anyway. Madison hates everything about Casey...from her less expensive wardrobe to the fact that Madison's long time friend and sort-of boyfriend Drew is drawn to Casey, and she's not going to let some small town hick take away what's hers. Things are about to get ugly. 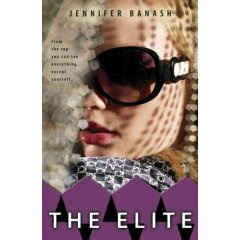 Before you start thinking that The Elite is just another novel of its genre, Banash surprises the reader by giving the seemingly perfect rich girls problems and flaws that aren't unfamiliar to Midwestern girls like Casey. It's a hard task to get readers to feel an ounce of empathy for mean girls like Madison, but Banash does it. When Madison is determined to humiliate Casey, rather than beat her at her own game, Casey admirably stands her ground, making her a real role model. But this novel isn't all about nasty remarks and stunning makeovers: it also explores the meaning of family, and the angst that comes with relationships that have run their course. Finally, a novel that isn't all about the materialistic things in life. This absorbing read will fly by quickly. P.S. Today is RANDOM COMMENTER WINNER day! Tell me what you think about these books, or what books you are looking forward to this summer, or whatever, and I'll pick one random commenter to win a copy of today's new release, The Elite! I've been dying to read "read my lips" for a while now. 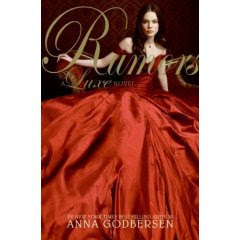 I'm also looking forward to "rumors by Anna godberson"
oh, all of the books seem great to me! i want to read them all! I've read THE ELITE, so don't enter me, but I just wanted to say--WHOA!--nice reviews. I'm really excited for the next book of Diana Wynne Jones's series. It's a sequel to Castle in the Sky[the sequel to Howl's Moving Castle]. Cool!!! I was reading the list of books and was intrigued with The Elite... and then I read that you're giving one away!!! Awesome! Hope I'll be the lucky one :) Thanks! Jennifer Banash Pays a Visit and a Chance to WIN!